Trainspotting star teams up with Band of Brothers' Iain Robertson to tackle Britain's highest mountain. Trainspotting actor Kevin McKidd has joined a group climbing Britain's highest mountain to raise funds for a charity supporting families affected by cot death. 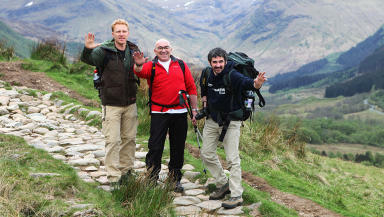 McKidd, who stars in US medical drama Grey's Anatomy, has teamed up with fellow Scottish actor Iain Robertson, who he appeared with in Small Faces, and film set chef and restaurateur Guy Cowan to take on Ben Nevis. The trio are raising money for the Scottish Cot Death Trust (SCDT). Rab C Nesbitt and Band of Brothers actor Robertson, 32, is an ambassador for the charity and has already raised more than £14,000. He said the charity was close to his family's heart after his elder sister Nicola died of cot death. "The support I have received in fundraising from friends has been incredible. It's all been pulled together last minute, but with Kevin's support and Guy's exquisite picnic to fuel us on our way I'm sure we'll make it to the top," he said. Money raised by the trek will go towards publishing a book, Andrew's Rainbow, for young siblings affected by the loss of their brother or sister through cot death. McKidd said: "I know that Iain has personal reasons for supporting such a worthy charity and I'm glad space in my schedule has allowed me to get involved. "As a parent I can't even begin to imagine what the loss of a child would feel like, I hope people dig deep to help the SCDT continue to offer much-needed support and assistance. "It's great to be home and taking in the Scottish scenery again, and helping out such a good cause in the process." Cowan added: "It will be great to team up with Iain and Kevin again, and raise funds for such a deserving charity. "I have fed both these boys many times through their film careers from Small Faces, Trainspotting and The Debt Collector and, as a result, I have prepared a delicious picnic filled with their favourite goodies to keep them going."